Grog’s head was aching, as if a load of bricks had been thrown at him, one at a time but every one with deadly accuracy. Light wormed under his eyelids, sharp as a paring knife. The Angel—was it back? He hadn’t heard the tones, but the light was relentless. “No,” he groaned. “I can’t hear you. I won’t hear you.” He rolled over, pressing himself closer into the wall. It was Grog’s time to rest. Something hard nudged against his ribs—the toe of a boot. “Get up, brainchow. You can sleep somewhere else.” Hands gripped his arms, yanking him to his feet. Men in dark blue jackets crowded the filthy room, yelling that everyone was under arrest and hauling people off the floor. The one holding Grog turned his stony face toward the rest, but his hand was a vise on Grog’s elbow. Grog blinked in confusion. “You’re not the Angel,” he said. Nightmare . . . Grog seemed to remember what that word used to mean. A dream, from which you could wake up. Pastor Daniel had promised he’d be all right once he awakened into his new life. Promised that the signs he was carving into Grog’s skin wouldn’t hurt for long, that the dust he rubbed into the wounds would transform him into someone special. But like everyone else back then, he hadn’t known anything. None of them saw the Angel, heard its voice, felt the call. They knew enough to scream, though. Scream and scratch and bleed and run away. Only Grog was left, untransformed and alone. The lawman had nothing to fear from Grog. No point in fighting for his freedom, not when it wasn’t really lost. The Rogue Mage world began long ago, when the epic battle between the High Host and the Darkness was won and lost. 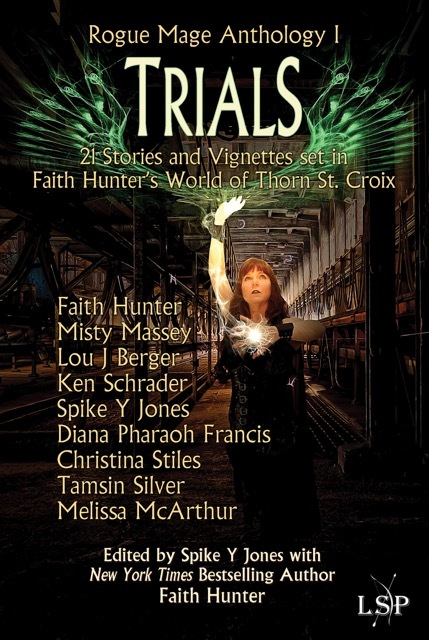 TRIALS takes fans of Thorn St. Croix into the past, before the opening pages of BLOODRING. 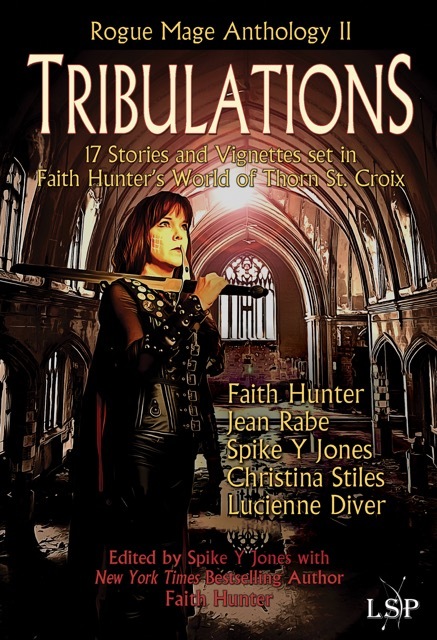 These stories, set in Faith Hunter's Rogue Mage world, are adventures with new characters and old, facing dangers unimaginable. And they must save the world all over again. 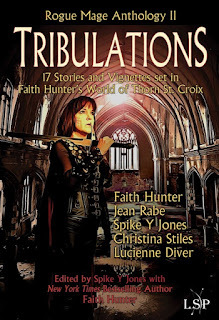 The Rogue Mage story began with the post-apocalyptic novels BLOODRING, SERAPHS, and HOST, when epic battles between Thorn St. Croix and the forces of Darkness were fought. 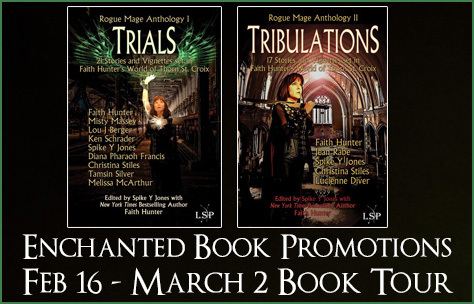 TRIBULATIONS (Rogue Mage Anthology Vol. II) takes place during and after the series timeline. 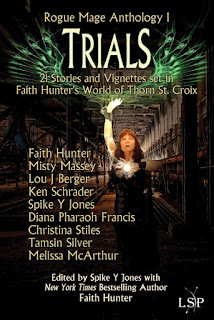 These stories and vignettes, set in Faith Hunter's Rogue Mage world, are adventures with new characters and old, facing Darkness and an uncertain future. 1. What was it like to play in the Rogue Mage world? It was wonderful and amazing. A clever, deep world that I envy, It touches on dark and light and the shades in between. And it has magic. Oooooooh! 2. Was it hard to develop your character within the confines of the Rogue Mage world? I came up with the idea right away...someone from a convent, who had religious schooling, and yet was at odds with it. A thief of sorts, but one who steals from the ground and the past rather than people. A cross between a junk man and Indiana Jones...and who likes to use explosives. I made her feisty and quick and more than a little selfish. I threw in a touch of a scholar. One of my favorite books is Norton's compilation of Old English literature. It gave me an opportunity to quote from that. She fit in well with the world because the place Faith created has all sorts of opportunities to relic-hunt. 3. Tell us about your character. Oops...I just did! I'll mention my day walker...he's beholden to the cartel that controls the jungle, but he becomes sympathetic to my main character and sees her as his way to get out. Too, he's got magic and loves Old English literature. They get along. 4. When your story was finished, how did you feel about your character and story? I was floating! I got to play in Faith Hunter's world! So...I was floating. 5. Tell us about your other projects. I'm working on the second book in my Piper Blackwell mystery series. This one is called The Dead of Night...and I need to finish it by the end of February. Cross your fingers I get it done.